Here, K(x, s) is a given continuous function of x and s called the kernel of the equation, f(x) is a given function, ϕ(x) is the unknown function, and λ. is a parameter (seeINTEGRAL EQUATIONS). Equations (1) and (2) were studied between 1900 and 1903 by E. Fredholm. The theory of Fredholm equations of the second kind is simpler, and these equations are more often used in applications. In the general case it is possible to obtain stable solutions of Fredholm equations of the first kind only with the help of special regularizing algorithms for the solution of incorrectly posed problems. a]k(x,t)u(t)dt over a fixed interval is called a Fredholm equation, while if the upper limit is x, a variable, it is a Volterra equation. 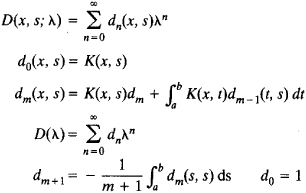 Which is a Fredholm equation of the second kind with the Kernel K a given function on the square G = [a,b] x [a,b].